What Causes Pipeline AC Interference? Transmission pipelines have been installed in dual right-of-ways (ROW) with overhead electrical transmission lines for many years due to concerns such as land access and environmental factors. 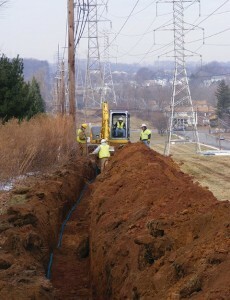 Although this is a mutually beneficial situation to have joint utility corridors, in some cases, in particular when overhead electric and pipelines run parallel together for a significant distance, electrical transmission lines can pose safety and corrosion problems for pipelines due to AC interference. A properly designed and installed AC mitigation system can reduce AC voltages to an acceptable level thereby greatly reducing AC corrosion. Pipeline AC interference and its effects in regards to safety remains a debatable issue. Typically the maximum touch voltage of an exposed, above ground pipeline is considered to be safe if it is below 15 VAC. Although this has been a historic norm some interpretations are recommending touch voltages of exposed pipe as low as 5 VAC to be more conservative when approaching it as a safety item. As far as buried pipe the touch voltage typically varies from 30 to 50 volts. MATCOR’s experience has been that with a properly engineered and installed AC mitigation system the touch voltage is lowered to a safe level in the range of 1 to 3 VAC which is far below recommendations for both above and below ground touch voltage thresholds. Corrosion of the pipeline is also a concern when confronted with AC interference. While historically it has only been thought of as a safety issue, for some time now numerous reports of corrosion caused by AC interference on pipelines have been published. Depending on factors such as types of pipe coatings, pipeline grounding, interaction with existing CP systems, and levels of AC exposure; increased current discharge caused by AC interference at holidays without proper mitigation can cause significant corrosion. Once again a properly designed and installed AC mitigation system can reduce AC voltages to an acceptable level thereby greatly reducing corrosive factors. To get in touch with our team of AC Mitigation experts for more information, to ask a question or get a quote, please click below. We will respond by phone or email within 24 hours. For immediate assistance, please call +1-215-348-2974.